In Update I, we discuss the deletion of the raw data that comprised the CRU database, the most widely used to “demonstrate” global warming. In Update II, we talked about the warm bias in the data caused by improperly sited thermometers. 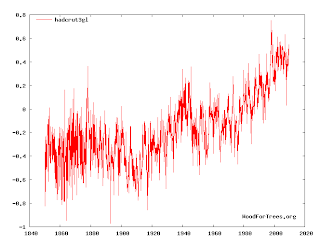 Here is the CRU temperatures for the last 150 years. In part III, we discuss what may be an intentional bias built into the CRU computer code. This is the part of Climategate that has been underreported. It is based on a file called “Harry Read Me” which part of the FORTRAN code where a programmer “comments” on what he/she is doing and why. I have read the Harry Read Me but have not attempted to analyze the code itself. It has been a long time since I did FORTRAN programming in college and I don’t trust my skills. If you wish to look at the code itself and multiple comments on it, go here and here. I can state: It is absolutely clear that the code is a complete mess. Nothing any rational person would bet trillions of dollars on. And, there are programmers who have examined the code who allege there are subroutines that artificially lower temperatures in the 1930's and inflate them in recent years. I cannot confirm this. What I can confirm is that regional temperatures seem not to confirm the worldwide trends depicted in the CRU temperature plots. This is from the longest continuous thermometer record in the world. Blue is 20th Century. Red is 18th Century. 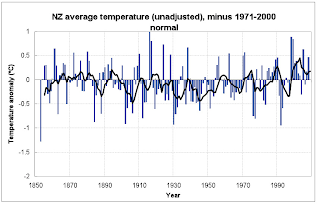 There is no significant warming. Of course, this is just one point in the world. Lets look at another. New Zealand. Little warming in 150 years. Steve McIntyre (who more and more looks like he should have been given the Nobel Prize) identified this two years ago as the "Where's Waldo" problem: None of the regional raw data plots seem to show the huge warning the world data plots from CRU show. Let me state it another way: If Britain and New Zealand don't show the huge rise, there must be a giant rise somewhere else to average into the large 1990's rise shown by the CRU (and NASA) databases. This illusive giant rise was named "Waldo" by McIntyre. He couldn't find the rise in the United States, Antarctica (/www.climateaudit.org/?p=1985) or South America ( www.climateaudit.org/?p=44 ) or China. So, here is where we are: CRU's data says there has been a giant temperature rise, but its system for computing the rise is -- at best -- a mess. Some contend there is fudging in the code (which I cannot confirm). 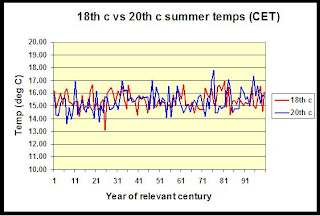 Steve McIntryre and others are not able to find, in the regional data, a large temperature rise that tracks CRU's. But, its got to be out there somewhere, right? After all the Arctic ice is melting and, according to the Associated Press, as recently as November 2, 2009, Kilimanjaro is melting due to "global warming." Maybe not. The subject of the next post. UPDATE: I hardly get these posted and there is a new development. "Waldo" isn't in Alaska, either. This is also pertinent to update IV (out of order) with regard to Arctic ice.